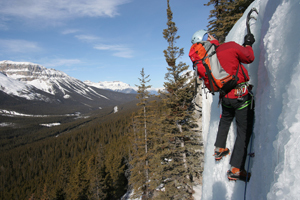 For intermediate and advanced ice climbers we offer a full technical ice climbing guiding service for the longer and more difficult climbs in the Canadian Rockies surrounding Banff, Canmore and Lake Louise. 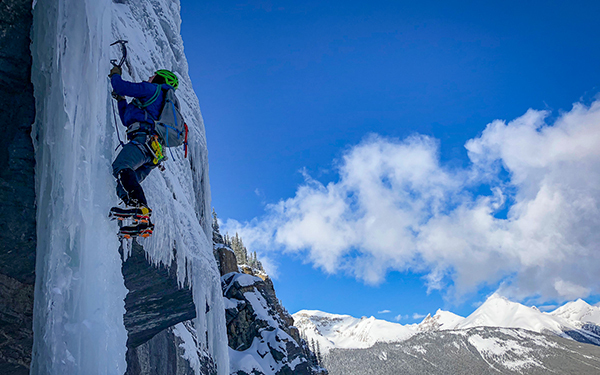 Join a Yamnuska ice climbing guide to experience great climbing, amazing settings and adventure on the frozen waterfalls of the Canadian Rockies. Our ice climbing guides work in the mountains year round but they live for ice climbing in the winter! The Yamnuska ice guide team is a highly skilled group of certified guides who exchange conditions information within our organization on a daily basis via the exclusive “Yam Ice Exchange”. Expert ice climbers and guides, they have the most current conditions reports for climbs in Canmore, Banff, Kananaskis, Jasper, Kootenay and Yoho. We have a daily check-in requirement for our technical ice climbing guides and safety is always our first priority. Yamnuska Mountain Adventures has a 7 x 24 duty manager who is equipped to support our guides and guests in the field should the need arise. 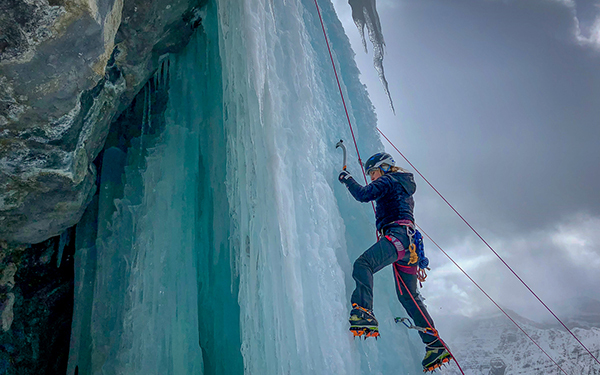 Most ice climbing guide trips start at our comfortable office in Canmore, Alberta Canada where our guides check conditions reports, file their trip report, and outfit you for any gear. 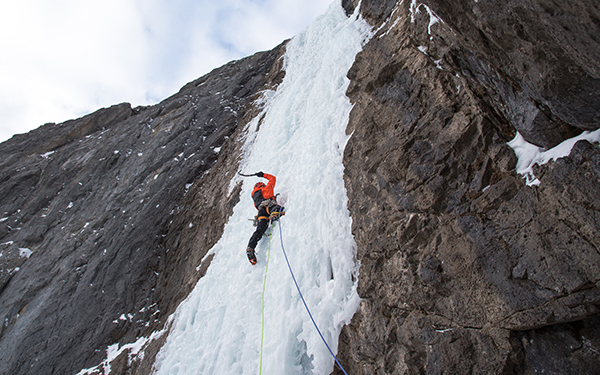 For more involved technical ice climbing trips we can meet where it is most convenient for you. We have been in business since 1977 and consider our ice guide team experts in the Canmore, Banff, Jasper, Kananaskis, Kootenay and Yoho ice climbing routes. We have guided guests from all over the world and are well equipped to plan your whole trip if needed. 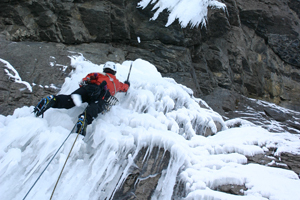 Personalized instructional ice climbing programs are tailored to meet your objectives. 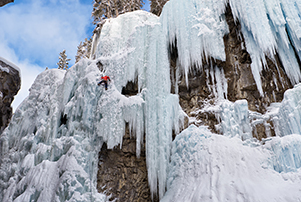 Regardless of your ice climbing background, Yamnuska guides are leading edge climbers and coaches who can take your climbing to the next level. You’ll receive a solid foundation in whatever aspect of ice climbing skill that you’re looking to improve on. Our maximum guide to guest ratio on single pitch programs is 1:6. There are many climbs to do and they are spread throughout the Canadian Rockies in our region. Several of which are minutes from our office in Canmore. Below is just a small sample of the classic ice climbs. When making your booking you can specify the climbs you would like to do or we can suggest ice climbs for you. The guide will retain the final say on what ice climbs are attempted as you must have demonstrated (either by having suitable prior experience or by climbing less serious objectives first) that you have the appropriate ability. Finally ice climbing and avalanche conditions must be safe. We meet daily to evaluate avalanche and climbing conditions. 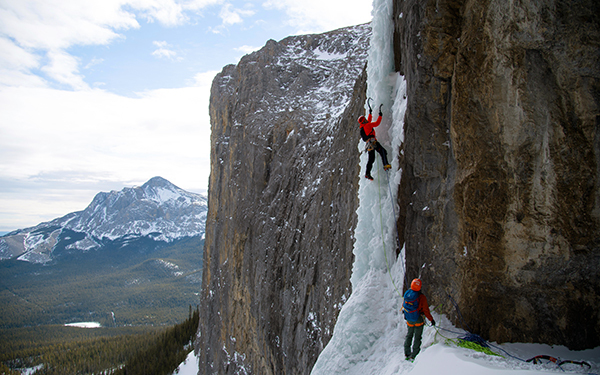 Yamnuska ice climbing guides are available to guide grade 2 – 6 climbs. Surcharges will be applied to more difficult and serious climbs. Cascade Falls: Scenic grade 3 route right outside Banff. Best to climb December through to mid-February. Professor Falls: Classic multipitch climb located near Banff beneath the imposing NE Face of Mt Rundle. Several grade 4 pitches. 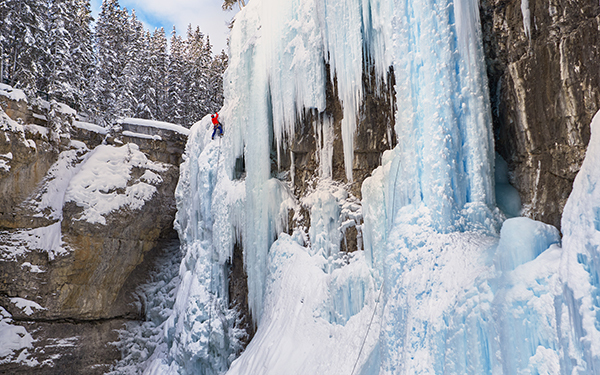 Johnston Canyon Falls: These famous falls freeze over into a variety of grade 3 – 5 single pitch routes. Many climbs in grade 4 -5 range reached from Smith-Dorian Highway and Highway 40. A wide range of excellent climbs reached after a 2 hour drive from Canmore. 4WD vehicle necessary. A great area with lots of climbs in the grade 3 – 5 range in a small area. Louise Falls: WI 3-5, 30 minutes walk from Chateau Lake Louise. Polar Circus: A world famous WI grade 5. You need to be experienced, fast and willing to pay a surcharge. The “Yam Ice Team” includes some of the best ice climbers and instructors anywhere! Enthusiastic and extremely talented, they hold climbing certification from the Association of Canadian Mountain Guides and from other International Federation of Mountain Guide Association (IFMGA) countries. Your safety and enjoyment are paramount to them. The maximum guide to client ratio for guided multi-pitch climbs is 1:2 and on single-pitch instructional days the maximum is 1:6. This is not included. Usually clients transport guides in their vehicles. For insurance reasons guides cannot transport clients. We suggest you rent a car whilst in the area. If necessary transport can be arranged either using a Yamnuska van or a taxi service. If a guide has to drive beyond Canmore to meet you for the climb gas charges may apply. We usually meet guests at our office in Canmore, Alberta but we can meet where it is convenient for you. 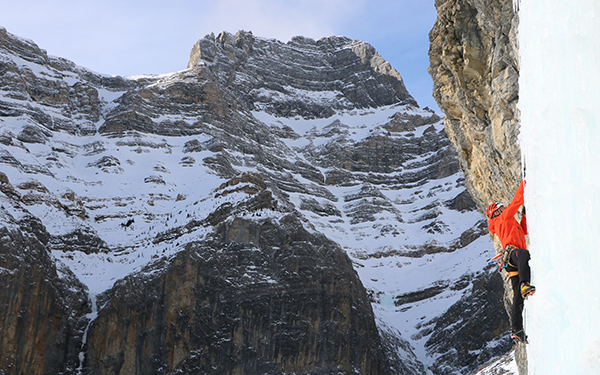 If climbing in Banff, Kootenay, Yoho or Jasper National parks daily entry fees apply. These are approximately $10/day per client and can be obtained on entry. These are not included but can be organized by our chef. Make sure you bring plenty of high-energy snacks plus plenty to drink. A Thermos with a hot drink is a good idea. There can be periods of inactivity in very cold temperatures. Don’t be afraid to bring too much! We suggest bringing light clothing of varying thicknesses that can be ‘layered’ to achieve comfort and versatility. The most important consideration for clothing is the ability to regulate temperature as you change from periods of activity to periods of rest. We discourage cotton clothing as it causes rapid heat loss when wet. Ski wear works well. *Available to rent, but you must advise us in advance that you need them. To book guided ice climbing just call or email our office. Registration requires a deposit of 35% of the cost or, for trips of three days or less, full payment. Balance of payment is required eight weeks before trip commencement. Should you cancel more than eight weeks in advance of trip, a $105 cancellation fee will apply. Cancellation between six and eight weeks before trip commencement will mean a loss of your deposit. Cancellation less than six weeks before trip commencement will result in a loss of all payments made. When hiring a guide we can quote you the following costs: guide fees, transportation, Park entry fees when applicable, local accommodation, your personal climbing gear, your lunches & snacks. Goods & Services Tax & gratuities not included. To properly manage safety there is a maximum of 2 climbers per guide on multi-pitch routes. 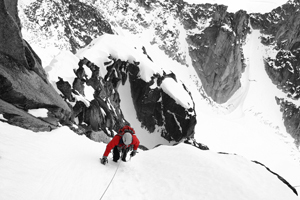 Certain very complex routes will have a maximum of 1 climber per guide. Single-pitch instructional programs have a maximum ratio of 1:6. 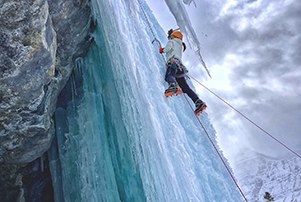 Ice climbing in Banff, Canmore and the surrounding Canadian Rockies is typically available from late November through until April. 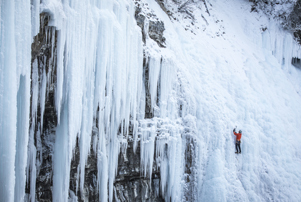 Optimum season is mid-December to mid-March for our world famous ice climbing.